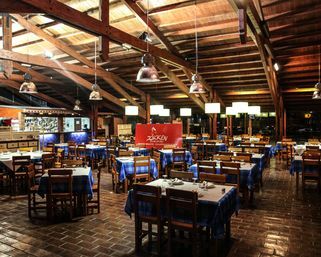 It’s with great pleasure that we present you our Barbecue Grill Restaurant, where the cuisine is based on grilled over charcoal and finished with our unique sauces. In addition to the “Chicken PiriPiri”, we have other specials distinguished by the taste and quality, such as the “Pork Ribs”, the “Piglet Belly” or the “Grilled Cod”, to go along with our Homemade Crisps, the Baby Roasted Potatoes or the Mediterranean Salads, all homemade. The cozy atmosphere indoors or on the outdoor terrace invites to a stop, with easy and private parking, a “Kids Playground” area, a Regional Products Boutique and the bar “ART POP CAFFÉ”.